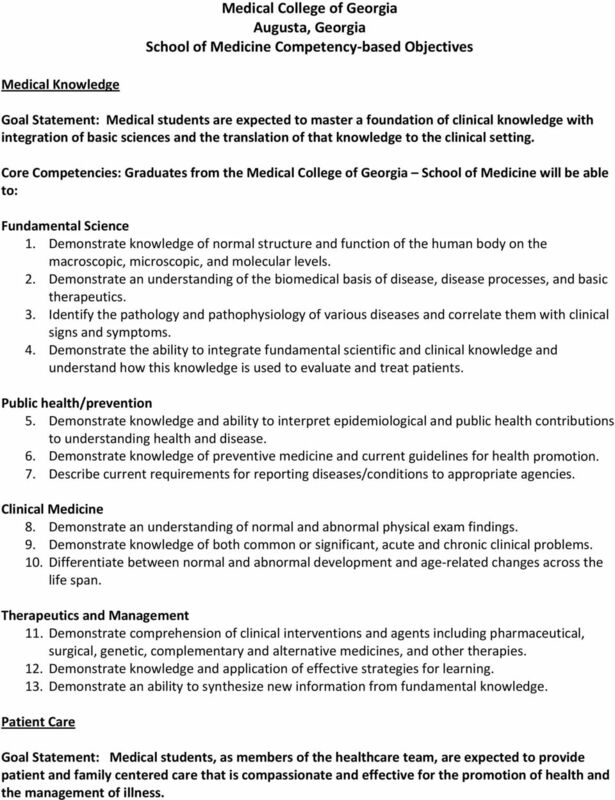 Download "Medical College of Georgia Augusta, Georgia School of Medicine Competency based Objectives"
1 Medical College of Georgia Augusta, Georgia School of Medicine Competency based Objectives Medical Knowledge Goal Statement: Medical students are expected to master a foundation of clinical knowledge with integration of basic sciences and the translation of that knowledge to the clinical setting. Fundamental Science 1. Demonstrate knowledge of normal structure and function of the human body on the macroscopic, microscopic, and molecular levels. 2. Demonstrate an understanding of the biomedical basis of disease, disease processes, and basic therapeutics. 3. Identify the pathology and pathophysiology of various diseases and correlate them with clinical signs and symptoms. 4. Demonstrate the ability to integrate fundamental scientific and clinical knowledge and understand how this knowledge is used to evaluate and treat patients. Public health/prevention 5. Demonstrate knowledge and ability to interpret epidemiological and public health contributions to understanding health and disease. 6. Demonstrate knowledge of preventive medicine and current guidelines for health promotion. 7. Describe current requirements for reporting diseases/conditions to appropriate agencies. Clinical Medicine 8. Demonstrate an understanding of normal and abnormal physical exam findings. 9. Demonstrate knowledge of both common or significant, acute and chronic clinical problems. 10. Differentiate between normal and abnormal development and age related changes across the life span. Therapeutics and Management 11. Demonstrate comprehension of clinical interventions and agents including pharmaceutical, surgical, genetic, complementary and alternative medicines, and other therapies. 12. Demonstrate knowledge and application of effective strategies for learning. 13. Demonstrate an ability to synthesize new information from fundamental knowledge. Patient Care Goal Statement: Medical students, as members of the healthcare team, are expected to provide patient and family centered care that is compassionate and effective for the promotion of health and the management of illness. 2 Global 1. Treat patients compassionately and safely with respect for their privacy, dignity, individual integrity, and culture. 2. Treat patients using a patient and family centered care approach. History and Physical Examination 3. Obtain a complete and accurate medical history that covers essential aspects, also addressing issues related to age, gender, culture, use of complementary medicine, family dynamics and socioeconomic status. 4. Perform both complete and symptom focused examinations, including mental status examination. Procedures 5. Explain indications for commonly used diagnostic and therapeutic procedures. 6. Perform or participate in routine technical procedures. [procedures determined by core clerkships] Diagnosis 7. Apply appropriate cognitive strategies (exhausting, algorithmic, hypothetical deductive, pattern recognition) to solving clinical problems 8. Construct a differential diagnosis for common complaints. 9. Identify the most frequent clinical, laboratory, roentgenologic, and pathologic manifestations of common maladies. 10. Choose and interpret laboratory diagnostic/screening test results and correlate them with history and physical exam findings and disease processes. 11. Recognize patients with immediately life threatening conditions and conditions requiring critical care. Therapy 12. 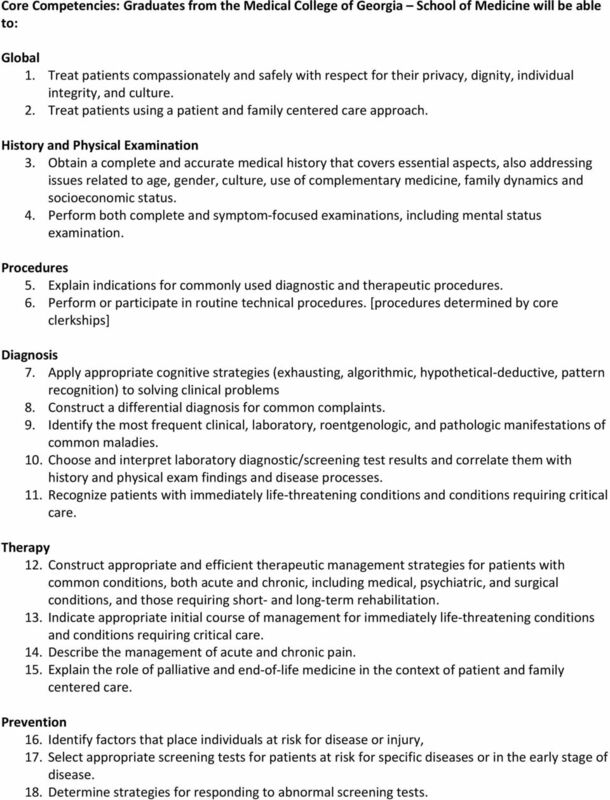 Construct appropriate and efficient therapeutic management strategies for patients with common conditions, both acute and chronic, including medical, psychiatric, and surgical conditions, and those requiring short and long term rehabilitation. 13. Indicate appropriate initial course of management for immediately life threatening conditions and conditions requiring critical care. 14. Describe the management of acute and chronic pain. 15. Explain the role of palliative and end of life medicine in the context of patient and family centered care. Prevention 16. Identify factors that place individuals at risk for disease or injury, 17. Select appropriate screening tests for patients at risk for specific diseases or in the early stage of disease. 18. Determine strategies for responding to abnormal screening tests. 3 Practice based Learning Goal Statement: Medical students are expected to investigate and evaluate their patient care practices, appraise and assimilate scientific evidence, and improve their practice of medicine. Personal and Professional Continuous Improvement 1. Develop a strategy for continuous individual improvement through monitoring performance, reflection, engaging in new learning, applying new learning, and monitoring impact of learning 2. Accept constructive criticism and modify behavior based on feedback. 3. Describe the benefits of team based process improvement. Locate, appraise, and apply evidence related to patients problems 4. Develop clinical questions related to patients problems. 5. Demonstrate skills to find relevant and valid information to answer clinical questions using medical information technology. 6. Locate and apply information from systematic reviews, clinical guidelines and evidence based reviews and apply to patients problems 7. Demonstrate the ability to appraise the quality of the information found to answer clinical questions 8. Discuss the levels of evidence and how they lead to strength of recommendations. 9. Identify high quality secondary sources of medical information such as guidelines, systematic reviews, cost effectiveness analyses, and evidence based summaries and read, understand, and discuss their content. 10. Demonstrate the ability to apply the new information into clinical care. Critical Appraisal 11. Define and interpret sensitivity, specificity, predictive value, and likelihood ratios for screening and diagnostic tests. 12. Be able to critically appraise studies of diagnosis, treatment, and prognosis. 13. Describe sources of intentional and unintentional bias that can affect study conclusions. 14. 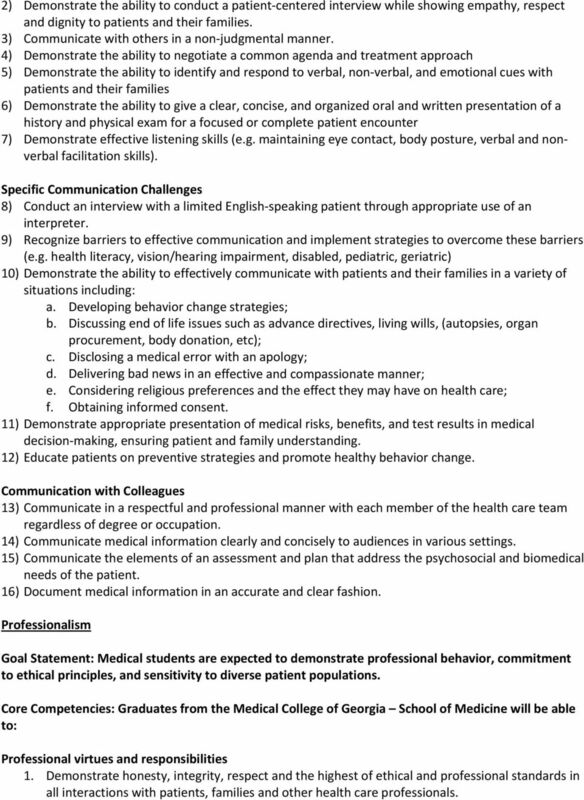 Define and interpret absolute risk reduction, relative risk reduction, number needed to treat, and their relationship to one another; Communication Competencies Objectives Goal Statement: Medical students are expected to demonstrate skills that result in effective communication and collaboration with patients, families, and professional associates. Basic Medical Interview 1) Demonstrate the ability to establish a positive patient doctor relationship based on mutual trust and respect. 4 2) Demonstrate the ability to conduct a patient centered interview while showing empathy, respect and dignity to patients and their families. 3) Communicate with others in a non judgmental manner. 4) Demonstrate the ability to negotiate a common agenda and treatment approach 5) Demonstrate the ability to identify and respond to verbal, non verbal, and emotional cues with patients and their families 6) Demonstrate the ability to give a clear, concise, and organized oral and written presentation of a history and physical exam for a focused or complete patient encounter 7) Demonstrate effective listening skills (e.g. maintaining eye contact, body posture, verbal and nonverbal facilitation skills). Specific Communication Challenges 8) Conduct an interview with a limited English speaking patient through appropriate use of an interpreter. 9) Recognize barriers to effective communication and implement strategies to overcome these barriers (e.g. health literacy, vision/hearing impairment, disabled, pediatric, geriatric) 10) Demonstrate the ability to effectively communicate with patients and their families in a variety of situations including: a. Developing behavior change strategies; b. Discussing end of life issues such as advance directives, living wills, (autopsies, organ procurement, body donation, etc); c. Disclosing a medical error with an apology; d. Delivering bad news in an effective and compassionate manner; e. Considering religious preferences and the effect they may have on health care; f. Obtaining informed consent. 11) Demonstrate appropriate presentation of medical risks, benefits, and test results in medical decision making, ensuring patient and family understanding. 12) Educate patients on preventive strategies and promote healthy behavior change. Communication with Colleagues 13) Communicate in a respectful and professional manner with each member of the health care team regardless of degree or occupation. 14) Communicate medical information clearly and concisely to audiences in various settings. 15) Communicate the elements of an assessment and plan that address the psychosocial and biomedical needs of the patient. 16) Document medical information in an accurate and clear fashion. 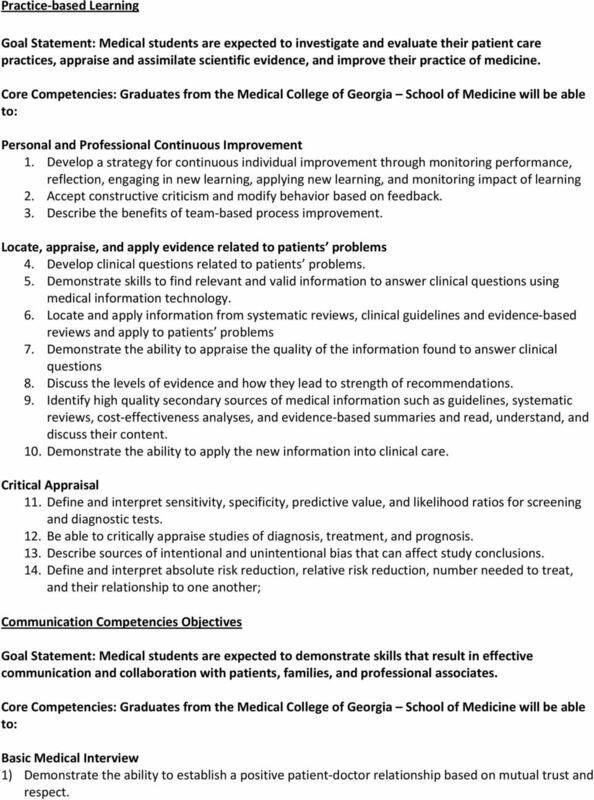 Professionalism Goal Statement: Medical students are expected to demonstrate professional behavior, commitment to ethical principles, and sensitivity to diverse patient populations. Professional virtues and responsibilities 1. Demonstrate honesty, integrity, respect and the highest of ethical and professional standards in all interactions with patients, families and other health care professionals. 5 2. Describe how the welfare of the patient or society supersedes the physician's self interest. 3. Fulfill professional commitments in a timely and responsible manner. 4. Maintain appropriate professional appearance and composure. 5. Seek help when needed. 6. Recognize and address personal limitations, attributes or behaviors that might limit one s effectiveness as a physician. 7. Recognize and maintain appropriate boundaries in physician patient interactions. 8. Identify risk factors for and signs of substance abuse and addictive disorders among health care professionals. 9. Explain the ethical responsibility for reporting impaired physicians. 10. Provide evidence of service to patients, communities, and/or society. 11. Advocate for access to health care for members of medically underserved populations. Ethical principles 12. 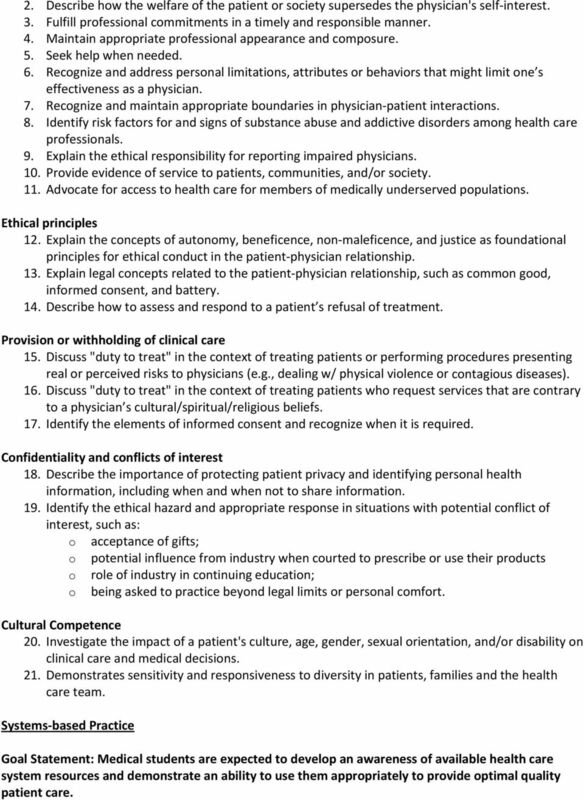 Explain the concepts of autonomy, beneficence, non maleficence, and justice as foundational principles for ethical conduct in the patient physician relationship. 13. Explain legal concepts related to the patient physician relationship, such as common good, informed consent, and battery. 14. Describe how to assess and respond to a patient s refusal of treatment. Provision or withholding of clinical care 15. Discuss "duty to treat" in the context of treating patients or performing procedures presenting real or perceived risks to physicians (e.g., dealing w/ physical violence or contagious diseases). 16. Discuss "duty to treat" in the context of treating patients who request services that are contrary to a physician s cultural/spiritual/religious beliefs. 17. Identify the elements of informed consent and recognize when it is required. Confidentiality and conflicts of interest 18. Describe the importance of protecting patient privacy and identifying personal health information, including when and when not to share information. 19. Identify the ethical hazard and appropriate response in situations with potential conflict of interest, such as: o acceptance of gifts; o potential influence from industry when courted to prescribe or use their products o role of industry in continuing education; o being asked to practice beyond legal limits or personal comfort. Cultural Competence 20. Investigate the impact of a patient's culture, age, gender, sexual orientation, and/or disability on clinical care and medical decisions. 21. Demonstrates sensitivity and responsiveness to diversity in patients, families and the health care team. 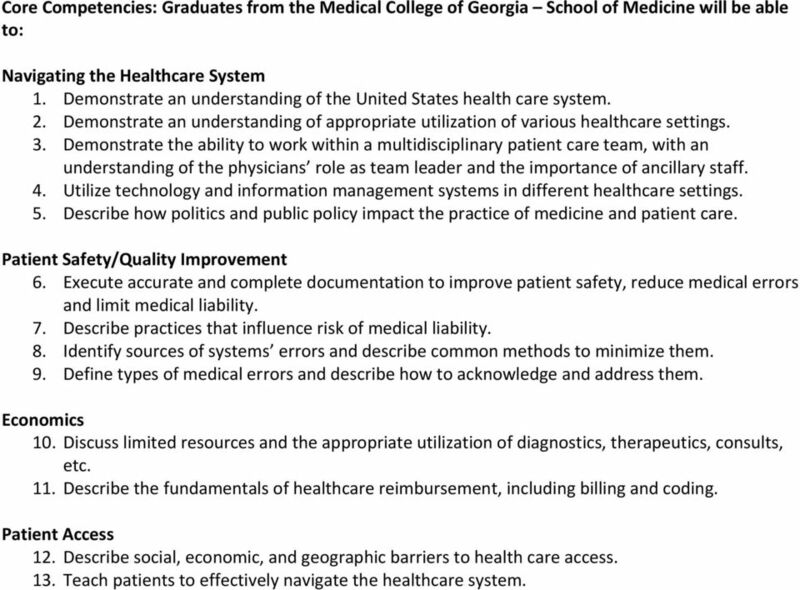 Systems based Practice Goal Statement: Medical students are expected to develop an awareness of available health care system resources and demonstrate an ability to use them appropriately to provide optimal quality patient care. 6 Navigating the Healthcare System 1. Demonstrate an understanding of the United States health care system. 2. Demonstrate an understanding of appropriate utilization of various healthcare settings. 3. Demonstrate the ability to work within a multidisciplinary patient care team, with an understanding of the physicians role as team leader and the importance of ancillary staff. 4. Utilize technology and information management systems in different healthcare settings. 5. Describe how politics and public policy impact the practice of medicine and patient care. Patient Safety/Quality Improvement 6. Execute accurate and complete documentation to improve patient safety, reduce medical errors and limit medical liability. 7. Describe practices that influence risk of medical liability. 8. Identify sources of systems errors and describe common methods to minimize them. 9. Define types of medical errors and describe how to acknowledge and address them. Economics 10. Discuss limited resources and the appropriate utilization of diagnostics, therapeutics, consults, etc. 11. Describe the fundamentals of healthcare reimbursement, including billing and coding. Patient Access 12. Describe social, economic, and geographic barriers to health care access. 13. Teach patients to effectively navigate the healthcare system. Psychiatric-Mental Health Nurse Practitioner These are entry-level competencies for the psychiatric-mental health nurse practitioner (PMHNP) and supplement the core competencies for all nurse practitioners.